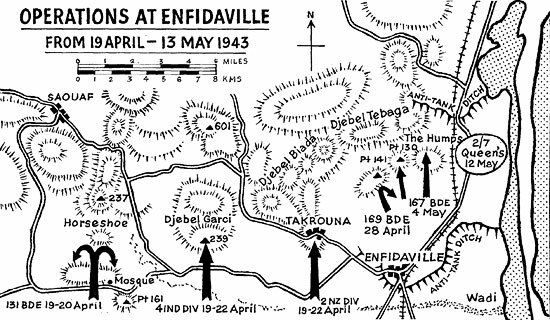 On arrival at Enfidaville the 2/5th and 2/6th Queen’s had taken over reserve positions behind the 2nd New Zealand Division, who were holding the low ground on the right of the Takrouna feature, having handed over Takrouna to the 51st (Highland) Division. They were very tired and needed to be relieved. General Montgomery had accepted that to try to outflank the enemy through the hills to the west of Enfidaville was now an unrealistic option, and had decided to switch his efforts to attacking up the coast road towards Hammamet. 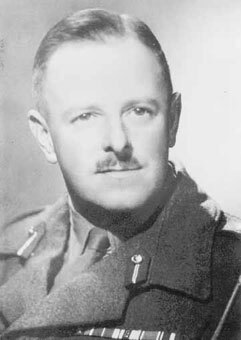 However, he disappeared off to Cairo on the 23rd April in order to discuss the plans for the invasion of Sicily, leaving Lieut-General Brian Horrocks to ponder the problem. Horrocks was not happy with this plan, and after long discussions with Generals Freyberg and Tuker, felt that such an attempt would be far too costly even if it did succeed. One of many problems was that about 1,000 yards in front of the New Zealand positions were two low hills, the Djebel El Srafi and the Djebel Terhouna, known as Points 141 and 130, in the hands of the enemy, which completely dominated any start line for a break-through attack up the coast road. The 50th Division and the New Zealanders had made three attempts to capture these hills but had been unable to do so, although Eighth Army Headquarters was under the impression that they were held by the New Zealanders. The discovery that these positions were actually occupied by the enemy caused great consternation. On General Montgomery’s return Horrocks voiced his doubts to him, but Montgomery only grunted noncommittally, and retired to bed with tonsilitis. It was therefore decided by the Eighth Army staff that pending any further decisions, at least the newly arrived 56th (London) Division could start the ball rolling by attacking and capturing Points 141 and 130. On the 26th April the 2/5th and 2/6th Queen’s took over from the New Zealanders directly opposite Points 141 and 130 with 167 Brigade on their left. The New Zealanders were very apologetic for their lack of success in securing these two features. 2/7th Queen’s arrived at Hergla the same day and on the 27th took over a position on the 2/5th’s right flank from the 2nd Scots Guards of 201st Guards Brigade. The 2/7th were almost immediately heavily shelled, especially their ‘D’ Company, the Company Commander, Capt F.J. Collins, being killed and Lt C. Williams wounded. ‘Lottie’ Collins was a great loss to the Battalion, since he had been with the unit from its formation in 1939. Meanwhile the 2/5th and 2/6th Queen’s were taking stock of their situation. The 2/5th was the most forward battalion, with the 2/6th echeloned back on their left. Lt Col John Whitfield of the 2/5th immediately made plans to capture Point 130, and allocated this task to his ‘B’ Company, the right forward company, commanded by Capt N.A. Oswald. He left the company commander to work out the details, and hurried off to an ‘O’ Group at Brigade Headquarters. On arriving there with Lt Col H.E. Wilson, the Commanding officer of the 2/6th Queen’s, he was told that both Points 130 and 141 must be captured that night. After discussion it was agreed that John Whitfield’s plan for the capture of Point 130 should go ahead, but that the 2/6th Queen’s should be responsible for capturing Point 141, operating through the 2/5th’s left forward company, ‘C’ Company. The 2/5th undertook to provide guides to lead the 2/6th to their start line. Both Commanding officers then rushed off to their battalions to complete their reconnaissances and hold their own ‘O’ Groups. Time was so short that it was impossible for the 2/6th to do more than make an outline plan and rely on the fighting qualities of subordinate commanders and soldiers to fill in the gaps. Unfortunately, bad luck dogged the 2/6th from the start. It was a pitch black night with pouring rain, and the guides from the 2/5th lost their way, failing to make the RV with the 2/6th’s representatives at the 2/5th Queen’s Battalion Headquarters. 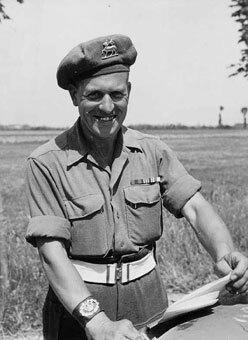 Since the Commanding Officer, John Whitfield, was the only person present who had been to the start line area, he took on the job of guide himself and successfully delivered two parties in succession to his ‘C’ Company area. He then did a third journey with Lt Col Hugh Wilson. Sadly this was the last time that these two Commanding Officers were destined to see each other as Hugh Wilson was killed early on in the subsequent action. This was another blow to the Brigade, as Hugh Wilson was a regular officer who had served with the 2/5th Queen’s at Abbeville and had remained with the Brigade since that time. encountered only minor opposition. During the consolidation phase, however, one of the platoon commanders, Lt G.V. Smith, was killed. The two forward 2/6th Queen’s companies ran into some defensive fire, but continued to advance resolutely and established themselves on and around Point 141 before first light. ‘C’ Company, 2/5th Queen’s, through whom the 2/6th had launched their attack, followed on behind and took up a position just in rear on the reverse slope. The whole of the ground occupied by the 2/6th companies and ‘C’ Company of the 2/5th was a massive rocky outcrop on which it was impossible to dig, the only cover available being from such sangars as could be built. Because there was so little time left before first light, there was considerable disorganisation when morning broke and the enemy, with perfect observation from their commanding positions on the main heights above, started to rain down concentrations of shellfire and mortar fire which caused many casualties. This confusion was partly due to the fact that Lt Col Wilson had been killed, and partly due to the inadequate time allowed for the 2/6th Queen’s to make a properly considered plan for the attack. As a result some of the platoons on the forward slope around Point 141 fell back to the olive groves in rear, having found that the exposed positions on the rocky slopes were untenable. The situation was stabilized by ‘D’ Company, 2/5th Queen’s, who were the left reserve company of their battalion, and the 9th Royal Fusiliers of 167 Brigade, who occupied a position along the western end of the Djebel El Srafi. At the same time ‘B’ Company, 2/5th Queen’s, on Point 130, also came under heavy shelling and mortar fire, and started suffering casualties, including the other two platoon commanders, but they were greatly supported by ‘A’ Company immediately behind them. Eventually they were counter-attacked, but unfortunately an order by one of the wounded platoon commanders was misconstrued, and the leading two platoons of ‘B’ Company withdrew to another feature 250 yards in rear. This left Capt Nigel Oswald and his Company Headquarters nearest the enemy. 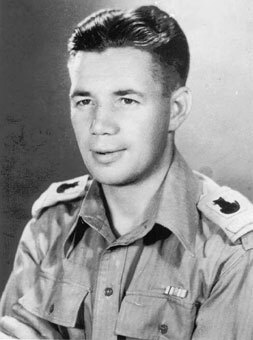 Nigel Oswald organised his position as best he could, and tried to get a message through to Battalion Headquarters, but his set broke down so Lt Col Whitfield remained in ignorance of this crisis for some hours. The withdrawal of the two ‘B’ Company platoons had been seen by some gunner OPs, who also spotted the counter-attacking force. Although John Whitfield did not wish fire to be brought down so close to the Company Headquarters, the FOOs used their initiative and fired a defensive programme which came down very close to Nigel Oswald’s position, but fortunately missed it! It did have the effect of driving the enemy off, however. These events had also been witnessed by Major A.L. Renshaw of 2/7th Queen’s, who commanded his ‘A’ Company to the right rear of Point 130. He had previously been in contact with Capt Nigel Oswald, and, appreciating the position swiftly and accurately, used his most commendable initiative and ordered forward his company to occupy the positions previously held by the leading platoons of Nigel Oswald’s company. By reacting so quickly to this crisis Alick Renshaw ensured that Point 130 was never unoccupied by the Queen’s during the action. 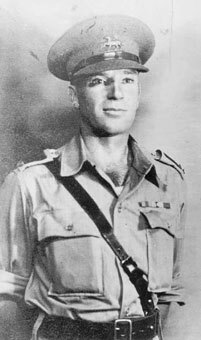 Major Alick Renshaw was awarded the MC. By this time General Alexander’s directive, that the Eighth Army’s role was to be that of merely containing the forces opposed to them, had become established. The 4th Indian Division, the 7th Armoured Division (including the 131st Queen’s Brigade) and the 201st Guards Brigade were on their journey round to the First Army’s front under the command of Lieut-General Horrocks. 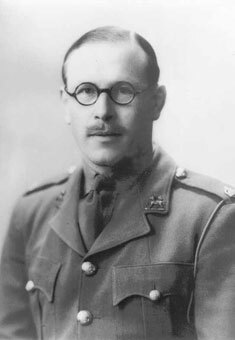 Lieut-General Sir Bernard Freyberg became the acting-GOC of X Corps. Frequent carrier and mortar patrols were sent out, especially to the still disputed Point 141, which the enemy never totally abandoned, though it was sometimes found to be unoccupied at night. 167 Brigade was transferred over to the right flank of 56th Division, and shortly after this move the 7th Oxford & Bucks of that brigade captured the exposed position called ‘The Humps’. On the 6th May the 2/7th Queen’s was ordered to relieve them, which proved to be a most unpleasant business, since to reach the weapon pits of the forward positions the relieving companies had to cross the open under observed machine-gun fire. ‘B’ Company suffered 20 casualties, including CSM D.G. ‘Tubby’ Fennings and Sgt H. Perry among those killed. Some of the company went too far forward into a wadi and ran into a minefield of ‘S’ mines. ‘C’ Company also lost five men during the relief. The new positions were extremely difficult to hold, being for the most part in full view of the enemy by day and under fixed line machine-gun fire by night. Even with the assistance of an armoured car, pressed into service by Lt (QM) Tom Manners, it was not possible to get rations to some of those on the forward slopes. A section of carriers under Capt Peter Hughes D’Aeth did valiant work in evacuating the wounded. Meanwhile the 2/6th had taken over from both the 8th and 9th Royal Fusiliers, whose positions were not as exposed, neither of these battalions having succeeded in advancing as far as the 7th Oxford & Bucks. On the 10th May the two Royal Fusilier battalions carried out another attack by night to hold the enemy’s attention, and on the 12th May 2/7th Queen’s were moved over to the extreme right of the front covering the coast road. The 6th Armoured Division from the First Army arrived in the enemy’s rear on the same day. Giovanni Messe, promoted to Field Marshal by Mussolini on the 12th May, held out with his remaining three divisions (the Young Fascists,Trieste, and the German 164th Light) until 11.45am of the 13th. The last twenty-four hours was noteworthy on the Eighth Army front for the greatly increased shelling as the First Italian Army fired off its last stocks of ammunition, and pillars of black smoke rose over the hills as they destroyed their equipment. The enemy had fought hard and fiercely right up to the end, and it had been a tough introduction to battle for the 56th (London) Division and the 169th (Queen’s) Brigade in particular. The 2/5th Queen’s had lost 15 killed and 70 wounded. 2/6th Queen’s lost their Commanding Officer, Lt Col Hugh Wilson, Capt B. Bateman and 15 other ranks killed, with four officers and 75 men wounded or missing. 2/7th Queen’s casualties were one officer and 12 men killed, and four officers and 62 other ranks wounded. There was a sad postscript to these events leading up to the surrender of the Axis forces. On the 8th May a German POW from the 90th Light Division volunteered to return to his own lines conveying the surrender terms from Lieut-General Freyberg as X Corps commander. Pte A. Ball of the 2/7th Queen’s Intelligence Section escorted the prisoner under a white flag to within 300 yards of the German lines before returning to Battalion Headquarters. Some hours later the prisoner returned, having failed to make contact with his comrades; but he set out again, this time accompanied by an Italian POW, Pte Ball and L/Cpl Mickey Walsh. This time the party was fired on by enemy machine-guns, the two POWs being hit. In attempting to find a safe route back to the Battalion, Ball and Walsh wandered into a minefield, and Ball was killed when he stepped on a ‘S’ mine.